Astrological symbols are among the most recognizable symbols in the world. They are the most easily accessible icons and are often called the symbols of the heavenly gods. These symbols represent the intertwining of physical or manifest science with the wisdom of the soul. If there ever was a field that has guided and influenced so many lives so powerfully, it would be astrology. 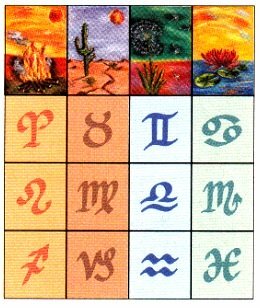 Astrological symbols are among the most popular used on every imaginable merchandise through the centuries. An astrological map of constellations and the solar system according to Copernicus, circa 1600s rendering. Astrology and astronomy were basically the same thing thousands of years ago. But around the medieval ages, some scientists no longer cared for the mystical science of reading the stars. They chose to focus on the objective observation of heavenly bodies for practical purposes. 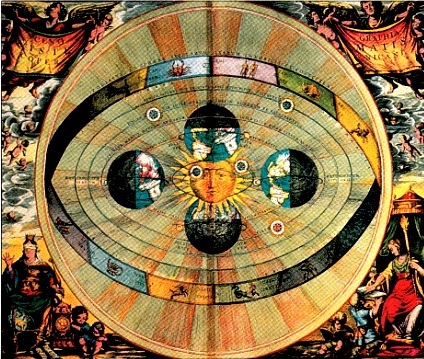 Astronomy then parted ways with astrology. Astronomy is alright, but don't you think astrology is so much more fun and exciting, not to mention magical and intriguing? It is a very fascinating and insightful tool for revealing the truth about who we are. I believe astrology points to us our finest qualities and best directions in life better than readings from fortune tellers. Today, astrology and geomancy are still widely employed by the biggest businesses and financial institutions in China, Hong Kong, most parts of Asia and certain societies in Europe and around the world. Find out more about astrology and zodiac symbols. You can also read more about the "houses" of astrology here. OR return from Astrological Symbols to the Symbolisms homepage.